You wanna hear something funny? 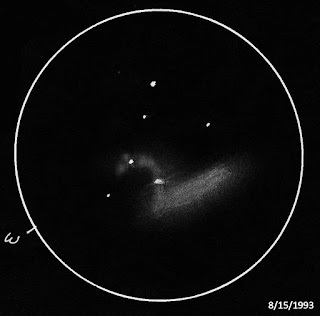 Back when I got started in amateur astronomy as a little kid in the mid-1960s, the Messier list was considered a challenge. At least on a par with the way many of you regard the Herschel 400 today. Heck, as a wet behind the ears novice, I was challenged just by the task of finding the freaking Andromeda Galaxy, but get deeply into the Messiers and even my more experienced brother amateurs (few sisters in those benighted times) would start quaking in their boots. Why? A couple of reasons. First and foremost, those really advanced amateurs with the giant Cave Newtonians you see in the little black and white pictures in ancient back issues of Sky & Telescope were a distinct minority. I mean a minority of a minority. Most of us struggled along with 4-inch reflectors and 60mm refractors. A little bitty scope, a suburban sky, and no filters and, heck yeah, M97 could be tough. Hell, M81 could be tough. Especially if, like me, you were saddled with the pitiful Norton’s Star Atlas as your finding tool. As I have oft said before, the key to finding deep sky objects easily the old fashioned way, by star hopping, is, in addition to good skies, having detailed charts. Tiny maps that only show stars down to magnitude 6, like old Norton’s is not a recipe for success. There was also the information factor. You would have seen pictures of these objects back then, some of them, but the pictures were almost always taken with giant pro scopes. What would M1, say, look like in a 6-inch reflector? Often you couldn’t even find a text description of how it would appear in an amateur’s scope. Most of the (few) amateur astronomy books in the public library were hold-overs from an earlier era, an era when amateurs looked at the Moon, the bright planets, and double stars. That’s why Kreimer and Mallas’ “A Messier Album” was so important. That let us at least get an idea what we should see in our little scopes. Yeah, John Mallas used a beautiful 4-inch Unitron refractor, but it was still a 4-inch. I loved the Messier Album columns, and they were the key, really, to my success with the Ms with my 4.25-inch mini-scope, and that makes me want to give something back. Consider this series an homage to Mallas and Kreimer, an Album for a new generation for whom an 8-inch is a small scope—you lucky ducks. We hit pay dirt right off the bat this time out. 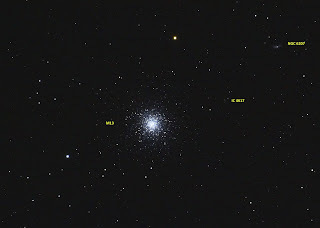 As I said a few Sundays back, I don’t necessarily think Hercules’ Great Glob is the best globular star cluster in the sky for northern observers. I think those laurels should probably go to M5 or maybe M22. Nevertheless, Herc is great. How could it not be with a magnitude of 5.8 packed into a just-right size of 20.0’ or arc? Do not get the idea that this object is necessarily a pushover if you look at it with a 6-inch or smaller telescope, though. It ain’t. A Shapley Sawyer Concentration Class of V (M15 is a IV) makes it pretty tight. I never was able to resolve it as an experienced observer with my Short Tube 80 achromat, much less with my old 4-inch Palomar Junior as a greenhorn. Well, maybe a star or two with the latter. Barely. Maybe. 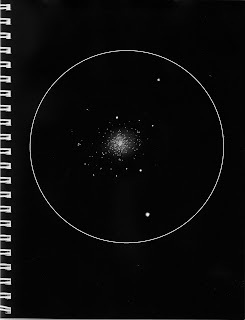 ‘Course, seeing stars in M13 depends on the quality of telescope you use, too, not just its aperture. I’ve had better success in resolving M13 under poor skies with an 80mm scope with excellent optics than I have with a 100mm that’s just so-so—my 80mm APO will show quite a few sparklers in M13, while my StarBlast 4.5-inch f/4 RFT struggles to show any at all. The refractor not only delivers tighter stars, it will take higher magnifications, reducing the impact of a bright sky background. If you want a tremendous view, however, think 8 or, better, 10-inches. Even from my humble backyard, the cluster is a marvel in a 10. M13, now that it is getting out of the light dome, is as beautiful as ever. Considerable resolution around its periphery with plenty of stars winking in and out even across its milky looking core. Tremendous numbers of tiny stars. Rather than looking almost spiral shaped as this cluster occasionally does visually in a larger telescope, in the ETX125 at 170x it looks almost hourglass shaped. If you are using a 10-inch or larger scope under dark skies, bump the power up to 300x or so and look for the “propeller,” a curious arrangement of dark lanes in the cluster’s halo that looks, yes, like an airplane’s propeller. Oh, and before moving on to the next M, detour about half a degree to the northeast and look in on NGC 6207, a pretty little 12th magnitude galaxy. We now go from the sublime to the ridiculous. 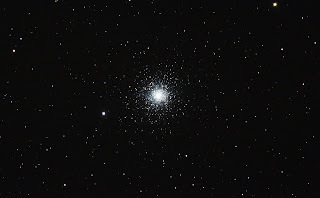 M14 is another globular cluster, but it couldn’t be more different from the one that precedes it in the Messier list. It is small (11.0’), and it is (relatively) dim (magnitude 7.6). It is also somewhat hard to find nestled as it is in a rather dreary area, southeastern Ophiuchus. If you’re more interested in seeing than hunting, the best way to get on this one is with a go-to mount or digital setting circles. Once you have Messier 14 in the field, what can you see of this star city? Not too much. On a below average summer night from the suburbs, I could see this sucka with my 12-inch Dobsonian, but just barely. It was a fuzzy star at lower powers, and increasing magnification delivered nothing more than a puny handful of stars that barely made this smudge look much different than an unprepossessing Virgo elliptical galaxy. From a dark site, you can pick out some more stars with 10 – 12-inches, but make it into a showpiece? No. And then it gets good again with yet another superb globular star cluster. While M15, located not far from Pegasus’ bright star Enif, the Horse’s nose (which gives M15 its nickname, “The Horse’s Nose Cluster”), is classified as a Shapley-Sawyer Type IV, which means it is on the concentrated side, visually it doesn’t look that way. The core is very bright, small, and tight, sure, but it is surrounded by an absolute horde of tiny stars in a somewhat elliptical mass. M15 is bright, magnitude 6.3, and despite its fairly large size, 18.0’, it takes magnification very well. The more power you can pour on, the more stars you can resolve in a compromised backyard, and the better this one looks. 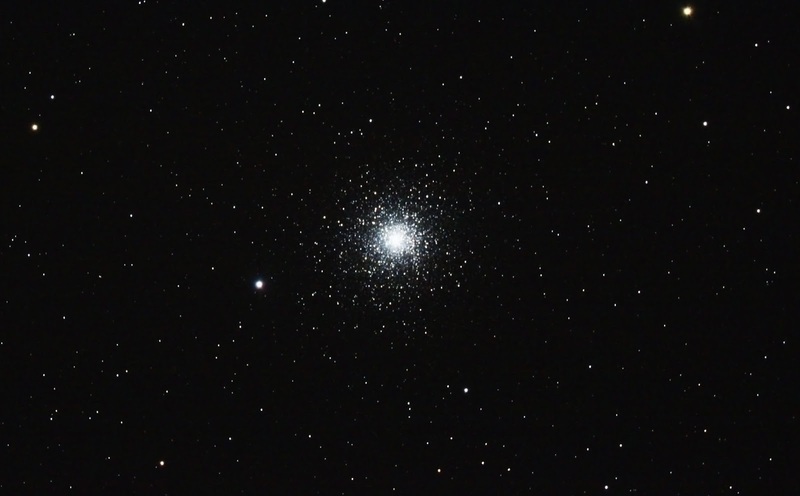 In my 10-inch Dobsonian, Zelda, at 350x not long back, M15 was simply stunning with its intense core (a black hole is thought to lurk there) and multitudes of minute stars everywhere. Want a real challenge? M15 contains a bonus deep sky object, the tiny planetary nebula Pease 1, which is situated just outside the cluster’s core. While the planetary is dim, magnitude 15 or so, that’s not what makes it tough. What does that is its small size, 3.0”. That’s “seconds,” not “minutes.” That makes the nebula nearly indistinguishable from a star, and if you are to have a prayer of seeing it you need magnifications of 400x and up, steady skies, and an OIII filter. The way to find Pease 1 is to “blink it,” to place the OIII between eye and eyepiece and alternately remove and replace it, making the planetary wink in and out (you hope). I have searched for Pease 1 seriously a few times, including with a 24-inch Dobsonian at high power, but have never been at all sure I’ve spotted it. Serpens' M16 is technically “just” an open cluster, but these days most of us automatically think “Eagle Nebula” when we hear “M16.” To be accurate, the nebula actually has the designation IC 4703. 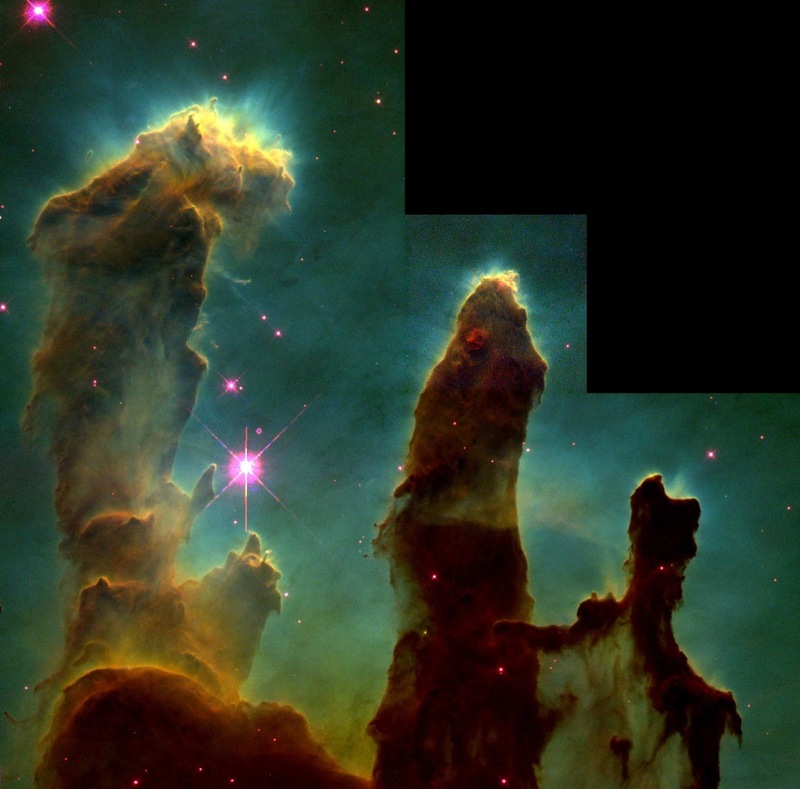 Whatever you call it, this is a tremendously famous object thanks to the Hubble Space Telescope shot of this emission nebula’s dark component, the Pillars of Creation. M 16 is low in the sky and there is heavy haze building, but with the OIII I can still make out the Eagle Nebula in addition to the cluster. Rather ill defined, moreso than usual, but I can see the spreading "wings" with averted vision. As conditions improve, so does this 6.0’ diameter gas cloud. And, “yes,” the pillars can be visible with the help of an OIII in a medium aperture—10 – 12-inches—telescope and a real good sky. Despite its low altitude, M17 is a marvel in the 6-inch Newtonian. Not only can I see the swan's neck, the “back” of the bird, the strip of nebulosity running from the neck is criss-crossed with dark detail. TeleVue Panoptic 27mm, 103x, UHC filter. M18…M18…which one is that? Oh, yeah, the open cluster a degree south of M17. Folks, there are open clusters and then there are open clusters. There are M11s and M35s, but there are also M29s and…yes, M18s. This is nothing more than a small knot of stars located near the northern edge of the great M24 star cloud—really its only claim to fame. It’s small at 5.0’ across, but also somewhat dim at magnitude 7.5. Worse, the best word I can use to describe it is “sparse.” Frankly, it looks better in my 100mm binoculars than in a telescope. In the binocs, it’s at least an interesting tiny condensation in the rich Sagittarius Milky Way. Back we go to Ophiuchus for another globular star cluster. Given its specs, mag 6.8 and 17.0’ in size, M19 should be maybe a little better than M14. Alas, no. What drags it down for us denizens of the Northern Hemisphere is its southerly declination, -26-degrees, which means it is a little close to the horizon even at its best. Which is not to say you should give it a pass. From my club’s current (semi) dark site, my 10-inch at 200x will regularly show about 10.0’ or so of it and resolve a few stars in its halo on those yucky, yucky feels-like-you’re-observing-from-underwater summertime nights. And that is where we’ll leave it for this time, standing on the doorstep of the next good one, the oh-so-wonderful M20. Next week? We’ll give the Ms another break and instead talk about one of my current obsessions, refractors. Thanks again, Rod. 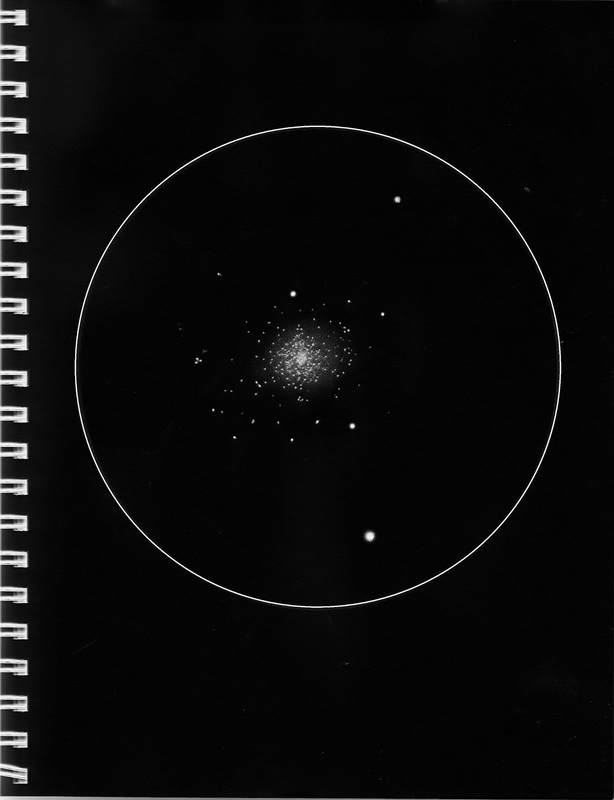 I especially liked your sketch of M-15, it reminded me of a view I had several years ago from my clubs old dark site (about Bortle 4.5) using my 7" f/5.4 Starmaster and a 20mm Nagler. What struck me was the setting as much as the cluster. At 48x (1.7 deg. field) in that little scope, it was a gem. If you get a chance, I suggest you try a similar magnification in "Big Ethel" when M-15 re-enters our sky. I have a question about the placement of a filter in the optical train. Being somewhat frugal, I only want to buy one size of filters. Does a filter need to be screwed into the end of the eyepiece or can it also be screwed into the end of a 2" to 1-1/4" adapter? Excellent third chapter in this series. Thanks for the honesty that will save me from wasting time on a doomed search for M14, also for your advice on which filters to use to enhance several of these objects. I've taken copious notes on this series and look forward to the next installment.